OST of the new season. Interesting, won't that spoil the music used in the rest of the series? Or will Fifth Stage be over before this OST comes out? Well, the album is Vol. 1 (full title didn't fit). Still hoping for new stuff. I just checked my Runaway mp3. Created 2008?!?! 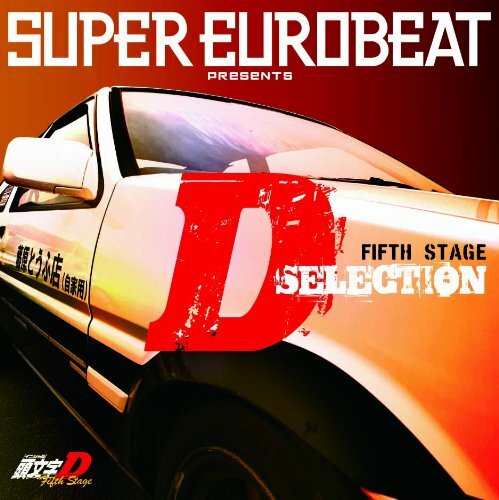 Super Eurobeat Presents Initial D Fifth Stage D Selection D Vol.1 up for pre-order! Just in case you guys are interessed! Just a note that CDJapan made a mistake in the weight and number of discs. I noticed them about it as I noticed them about this release too (ans SEB 221). I feel kind of bad of copy-paste posts like this but, hey, I need to make the information as seen and available as possible! I will definitely be getting this. I Hope they release sound files too. Im liking them a lot this season. CDJapan just replied to me regarding the DVD. Apparently, "Someone misunderstood the description the record company supplied, but it does not include a DVD". So, yeah. 15 tracks CD only it seems. The tracklist would be interessting. But I think we will have to wait for that, huh? I heard that there will be new tracks. Interestingly, the release date for this D SELECTION coincide with the air date of Episode 7 & 8. There are only two Eurobeat tracks used in Episode 1 & 2. Assuming there will be more actions in the episodes following and perhaps two new tracks every episode from here on. We will have 2 + 4 + 4 + 4 = 14 tracks including Episode 7 & 8. So yes, 15 tracks sounds about right, perhaps one of the episodes will have three new tracks. We'll have to wait and see. I don't know if this issue has even been discussed. But is ID really that dependent of the SEB series? I always imagined that the writers/producers of the show pick songs directly from Eurobeat labels and not from the SEB pool of songs. Do you remember 4th Stage? There was quite a bit of songs that never made it onto SEB (except maybe nonstop versions). Off my mind, I can think of "Mission Impossible" by Nick Mansel, "Takumi" by Neo, "The Fire's On Me" by Spock... the list goes on. The thing is that, these days, new tracks aren't produced as much as they used to. Now, it's like, a song is produced then it ends up on SEB. That's the feeling I get anyway. Between SEB 170 and 220, SEB's fanbase dcreased to an incredibly low-level. I heard that barely 500 albums (or something that low) were sold each month when they used to sell thousands of copies during the golden times. Initial D might just give the series a boost and I hope that the fact that SEB 221 comes and the first volume soundtrack of the CD coming two weeks of each other is a good sign for that. So far, there's no new material and I think that it's disturbing. Only 500? Ok, I would have never thought that. That gives me a whole other picture of the music. We were always dubbed nerds listen to this "Italian music only sold in Japan" but I never imagined that we were that ... how do I say ... lonely? I say 500 as an exemple but I remember the number being... very low. Eurobeat isn't as mainstream as it once was in Japan. Eurobeat is an underground genre now and we're still lucky though that there are indie labels still recording it. We are also lucky to still have Avex releasing material. We are also lucky to still have Avex releasing material. There's a couple ways to tackle this statement. You could say "yes, we are lucky that Avex is still releasing material" because it's extremely unusual for a major record label to continue to press and market albums that don't sell at least in the thousands, let alone just a few hundred (unless it's an intentionally limited edition). Honestly, even I find that remarkable. But at the same time, I refuse to say that we're lucky because while Avex is an important company for eurobeat, it's still just a company. When you get down to it, it's not about whether Avex releases eurobeat or not, it's about whether eurobeat artists release eurobeat or not. Frankly, it should not matter whether Avex stops releasing eurobeat, because it's not as if the artists are quitting their craft. Especially when you consider that only a few hundred units are being sold - the artists could probably print CDs themselves at that kind of stock level. Still, you'd be a fool not to understand Avex's importance in the eurobeat scene. It's about more than making CDs available, it's also about marketing and exposure. They do a decent job of it, but if I had to complain, I'd say they cater to the dedicated fanbase a little too much. Well, maybe I should word that differently. I'm pretty satisfied with how they stay true to the fans, but I think they should focus on gaining some new ones and expanding their market. I would suggest marketing to more diverse audiences internationally, but that would be a difficult task, even for a major label like Avex. At any rate, Avex is still an important figurehead in eurobeat, since they are responsible for the world's longest-running music compilation series of all-time, but don't equate them with the artists themselves. Eurobeat will not die if Avex tosses SEB. If it does, that's not Avex's fault. Art wants an audience but the size of that audience will vary. Eurobeat can always continue to survive, but it will depend on how small an audience the artists are willing to accept in order to continue making it. Will they stay true to the art they've been making and not let the size of their audience determine whether or not they will continue to make their music? Or will they take the more vain and money-centric route of ceasing to produce something when it no longer sells? That's the big question I have. We'll see the answer when the time comes, but I hope it doesn't come for a long time. With SEB now returning and the ID on its way we can at least enjoy 2013. Maybe our discussion here will even end with everything coming back in a better way. I have my hopes up. I never said that Eurobeat was going to die without Avex. The problem isn't the Japanese following - that alone will provide Eurobeat for eternity. What I'm worried about is if the italians will still do Eurobeat without Avex. Of course, SCP, Dima, SinclaireStyle and Hi-NRG Attack are pretty sure to continue whatever the situation. The thing is that I fear that the Japanese are too-closed minded. They buy things within Japan and do things to be purchased within Japan and that reduces odds of them purchasing outside of Japan which can make selling digital and/or physical things difficult for the italian labels. And, that reduces the will to continue to do more music. You'll have to be real passionate to continue to do music under these circonstances and I hope the italian labels are still passionate enough to continue to do Eurobeat for us for a very long time, don't get me wrong. Where did you get that tracklist? Wow, that's an... interesting cover.